Tópico em 'Europa' iniciado por Vince 24 Set 2007 às 14:18. Uma serie de tornados hoje em UK, parecidos com o tipo de tornados que tivemos o ano passado em Portugal, associados a uma frente. Relatos em diferentes locais como Farnborough, Nuneaton, Luton, Northampton, etc. A series of tornadoes has struck communities across England, damaging homes and vehicles and uprooting trees. The Met Office confirmed that a squall hit Northampton, where falling branches damaged an empty school bus. 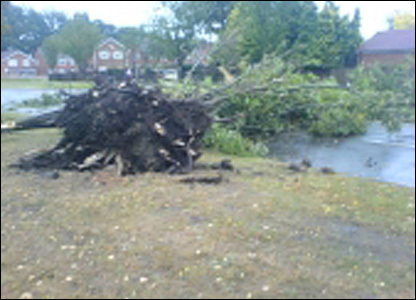 It also said that a violent storm damaged gardens and homes in Luton, Bedfordshire. 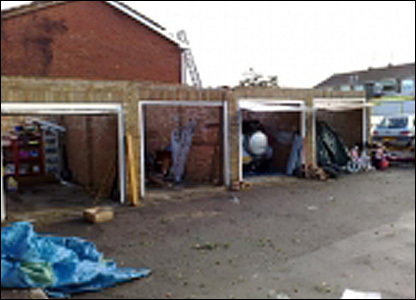 Part of a factory roof was blown off in Breaston, Derbyshire. Also affected were Farnborough, Hants, and Nuneaton, Warks. Similar conditions were reported in Ollerton, Notts. Nina Ridge from the BBC Weather Centre said that the winds reached 60mph. In a statement, the Met Office said that the gusts were "conducive to tornadoes" and measured T2 or T3 on the TORRO scale (which ranges from 0 to 10), meaning they were "moderate to strong". 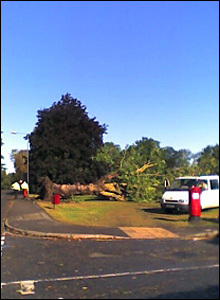 It added that in Luton a violent storm hit at 0700 BST, damaging gardens and ripping tiles off house roofs. 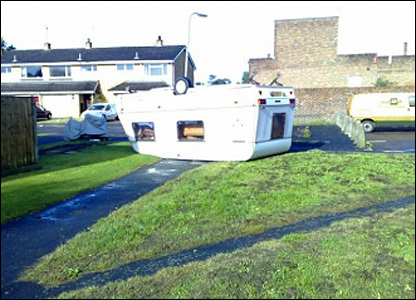 Ruth Spaull of Luton said that she saw "a funnel of wind" lift her daughter's trampoline 15ft (4.52m) into the air. According to the fire service, 20 houses were hit in Farnborough, Hampshire, at 0800 BST, tearing away a garage roof and uprooting trees. Terry Parrott, who lives in Farnborough, said he looked out of his window to see a "complete whirling mass". He added: "Caravans have been upside down, trees uprooted, bus shelters destroyed. It's just complete devastation." Tim Vile, incident commander for Hampshire Fire and Rescue, said the area looked "like a battle-zone". Northampton resident Andy Summerville told BBC News 24 that the sky went "completely black" at around 0710 before tiles were blown onto parked cars. Winds damaged around 20 homes in Trafford Drive, Nuneaton, with tiles pulled from roofs, cars smashed and debris scattered across the streets, Warwickshire Police said. The local borough council said 35 homes were damaged in the Mallard Avenue and Kingfisher Way area. Lollipop lady Beryl Warburton, 79, who lives on Trafford Drive, said the "frightening" storm struck at about 0615. She said: "Some of the houses have had their roofs taken off completely, some have lost parts of their roofs." A MOTORIST was left "gobsmacked'' today, when the car travelling in front of him was lifted off the road by a "tornado''. David Hetherington (49), from Bretton, was heading east on the A47 at Eye, at about 7.40am, when a heavy gust of wind ripped four-inch thick branches off trees, before lifting a Peugeot 405 estate, 10 yards in front of him, off the ground. The gust, coupled with torrential rain, spun the car around into a Volkswagen Caddy van, travelling in the opposite direction, sending the van into a ditch. Mr Hetherington, who alerted the police and ambulance service, said: "The car was lifted at least a few inches off the ground. "It was absolutely amazing. I was gobsmacked. I have never seen anything like it." were causing a hazard. Rush hour traffic faced delays of about 20 minutes. The drivers of the vehicles were shaken, but only suffered minor injuries. The were also reports of a tornado causing damge on the A605 near Whittlesey. Full story and pictures in tonight's ET. At least four tornadoes have been reported at Farnborough, Luton, Nuneaton and Northampton. Hundreds of homes were damaged as severe weather swept across the country. Sky's David Crabtree reports from Nuneaton.